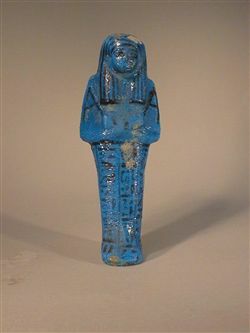 The mummiform shabti wears a striated wig, that does not cover the ears. The arms are crossed right over left, both hands hold hoes. The sleeves are indicated, as are the features of the face, albeit only roughly. It carries a bag on the back. The text is written in vertical lines all over the lower part of the statuette. (8) any time, "I will do it, here I am", you shall say.